We have it on good authority that these notes have only one side. A study commissioned by environmentalist groups claims that ninety-five percent of all the Post-it notes sold worldwide last year were wasted because people only wrote on one side of the paper. The sticky notes, which are designed to be briefly attached to a variety of surfaces before dropping off and getting lost the moment your back is turned, are a feature of most offices, but researchers found that users typically only wrote on one side. Not surprising, perhaps. 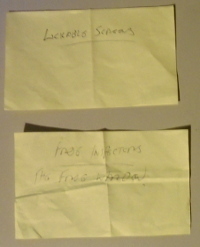 Indeed, one expert in the combined disciplines of mental health and stationery has gone on record as saying that people who write on both sides of Post-it notes are usually clinically insane, although he was unable to produce evidence of this as the note that he wrote it on was lost some time ago when it fell off the fridge. Nevertheless, manufacturers 3M have taken the report very seriously, recognising that consumers' reluctance to use both sides of the paper has resulted in unnecessary wastage. Their solution is the introduction of a revolutionary new one-sided Post-it note, due to go on sale sometime next year. Details are sketchy at the moment, but a press release claims that 3M boffins have achieved this remarkable feat by taking an ordinary three-dimensional Post-it note and carefully removing one of the dimensions. The result is a piece of paper which is all front and no back. Extraordinary though this breakthrough is, critics have already pointed out that a Post-it note with no back wouldn't be able to stick to anything. 3M have responded by saying this has never bothered anyone in the past.